The arrow indicates a ventricular extrasystole (VES). A VPB is an ectopic beat that originates from the ventricles. VPBs are conducted by the specialized conduction system and therefore are broad. The QRS width is at least > 0.12 seconds, but often very broad at around 0.16-0.20 seconds. The VPB is usually followed by a compensatory pause, however this can be absent in the presence of retrograde conduction through the av-node. Causes: e.g. ischemia, hypoxia, old scar tissue, idiopathic. Fifty per cent of healthy men have sporadic VPBs. The origin of the VPB can be derived from its form. An LBTB-configured VPB originates in the right ventricle. An RBTB-configured VPB comes from the left ventricle. The QRS duration of a VPB is > 0.12 seconds and can be as wide as 0.16-0.20 seconds. 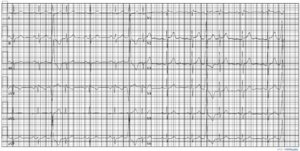 A sequence of three or more extrasystoles is called a non-sustained ventricular tachycardia. monomorphic: all VPBs have the same configuration and thus have a mutual focus of origin. multiformic: the complexes have different configurations. bigemini: every sinus beat is followed by a ventricular extrasystole. trigemini: every second sinus beat is follow by a ventricular extrasystole. VPBs are associated with numerous cardiac diseases (e.g. structural heart disease, ischemia, congenital arrhythmias, pulmonary disease). However, VPBs are also relatively common in patients without known heart disease. The importance of VPBs for prognosis is controversial. A study by Abdalla et. al  followed 15.637 apparently healthy men aged 35 to 57 years. The prevalence of VPBs was 4.4%. In a subgroup of patients with frequent (2 or more uniform VPCs every 2 minutes) and complex VPBs (multiforms, pairs, runs, R-on-T) the risk of sudden cardiac death was 4.2. In the Framingham study 12% of men and 33% of women without clinically evident coronary heart disease had frequent (>30 VPBs per hour) or complex VPBs. In men, this was associated with a two fold increase of death. However, in another study asymptomatic patients had a good prognosis. Therefore, probably sporadic VPBs are relatively benign, whereas frequent and complex VPBs are reason for further examination. This page was last edited on 23 June 2013, at 20:37.